PLYMOUTH, Mich. – It was way back in July when Ken Holland invited Henrik Zetterberg to play a round of golf. The general manager beat the player, a professional athlete in his prime, but he soothed the pain in the parking lot. "I've got one more thing I'd like to talk to you about," Holland said as they stood by Zetterberg's car. Holland asked Zetterberg if he was comfortable becoming the next captain of the Detroit Red Wings. Zetterberg said absolutely. They shook hands. And what had been speculated since the retirement of Nicklas Lidstrom became official there at Meadowbrook Country Club. 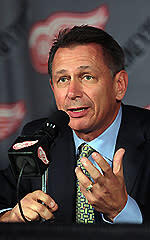 So why did the Wings hold a news conference six months later to announce what everyone already knew? Because of the lockout, of course. Because maybe they were hoping Lidstrom would reconsider. But also because it wasn't about news when Holland handed Zetterberg the ‘C’ on Tuesday night. It was about tradition, continuity, culture – the program Holland hopes to keep humming against the odds. In that parking lot in July, Holland told Zetterberg the Wings wouldn't announce the captaincy until training camp, and sure enough, the Wings waited. They didn't confirm multiple reports. They didn't put out a press release. While players talked about it openly, they essentially winked. They waited until they could assemble virtually the entire organization before a scrimmage – from retired players working for the team, like Chris Chelios and Kris Draper; to the current roster, including alternate captains Pavel Datsyuk and Niklas Kronwall; to the Grand Rapids Griffins, their minor-leaguers – so everyone could see and hear it. "More than anything," Zetterberg said, "this is a very big responsibility." Zetterberg is only the third captain the Wings have had in a quarter century. He is taking over for Lidstrom, who was known as "The Perfect Human." Lidstrom took over from Steve Yzerman, who was known as "The Captain." Yzerman revived the legacy of Alex Delvecchio, Ted Lindsay and Gordie Howe. "It's very big shoes to fill," Zetterberg said. And it's a very difficult time to fill them. The Wings haven't missed the playoffs since 1990, and it's fair to wonder if this is the season they will slip. Lidstrom is gone, after setting the standard for two decades, and he cannot be replaced. Brad Stuart left as a free agent, creating another hole on defense. The competition has caught up, thanks to the salary cap, and this season will be only 48 games, thanks to the lockout. It's going to be even tighter and more unpredictable than usual. This reminds Holland of where the Wings were after the last lockout. First, their payroll was cut in half in 2005-06 because of the cap. Then, Yzerman retired after the season. "There's a lot of uncertainty," Holland said, "and I'm not sure where we are." But we've been wondering if this is the season the Wings will slip for how many seasons now? Though no one should assume their success will continue, no one should assume it won't, either. Zetterberg pointed to Holland and his staff. 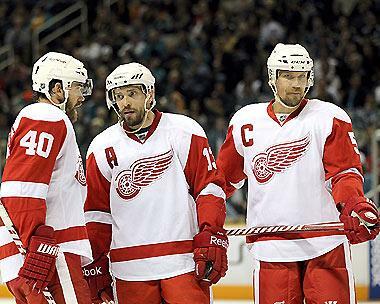 "They always find players that come in and play," Zetterberg said. "They wait until they're ready to come, and when they come, they're ready to play." Zetterberg is a shining example. Holland called his captaincy the "evolution of a leader," but it reflects the evolution of an organization. Holland said that the leaders "set the tone" and "it's really passed on from one generation to another." Because of their success, the Wings haven't had a top-10 draft pick since 1991. But they have defied gravity with shrewd scouting, smart management and a little luck. They struck gold when they drafted Datsyuk in the sixth round in '98 and Zetterberg in the seventh round in '99. They left them in Europe until they were prepared for the NHL, and they brought them into a mentoring environment when they made the NHL. That's the kind of thing the Wings have done with all types of players, and that's why the Wings have continued to thrive after the departures of Yzerman, Sergei Fedorov and others. When will the Wings have to rebuild? They have been rebuilding. They have always been rebuilding. They have won four Stanley Cups since 1997. Only five players were part of them all, and only one of those players was a star: Lidstrom. The others were role players – valuable role players, but role players – Draper, Tomas Holmstrom, Kirk Maltby and Darren McCarty. Holmstrom almost shouldn't count because he played little in '97. They won three Cups before the salary cap era (1997, '98, 2002); they won one during the salary cap era ('08) and came within a game of winning another ('09). They won with Yzerman, and they won after he retired. They won with Lidstrom, and now … well, they will try to keep doing what they have been doing for years. "We're trying to compete with the best teams," Holland said. "We're trying to stay in a playoff spot. There's an overhaul, a reload, a new era of players coming along. If we can continue to be competitive, you're not going to notice it as much. When the team falls out of the playoffs, then you notice it." But if the Wings are in danger of falling out of the playoffs at the trade deadline – or even if they finally fall out of the playoffs this season – don't expect Holland to panic. He is not likely to sacrifice the long term for the short term. He knows the New Jersey Devils missed the playoffs in 2010-11 and went to the Cup final last season, and he knows they lost to the Los Angeles Kings – the eighth seed in the Western Conference. The Wings cannot stockpile talent the way they did before the salary cap, when their payroll pushed $80 million and their roster looked like a Hall of Fame ballot. But no one else can, either. And even the Pittsburgh Penguins – with Sidney Crosby, Evgeni Malkin and a strong supporting cast – lost in the first round of the playoffs last year. Parity has allowed the competition to catch up. At the same time, it won't let the competition pull away. "Who are the Cup contenders? I believe the Cup contenders are the 16 teams that make the playoffs. Just look at the Stanley Cup playoffs year after year after year. Even if the first-place team beats the eighth-place team, it goes to Game 7." Holland's best chance to add elite talent is through free agency. He didn't land Ryan Suter and Zach Parise last summer, but it wasn't an indictment of Detroit. The Wings were close with Suter, at least, and there were only two marquee names on the market. There will be other free agents, and they only need one or two. A team can fit only one or two. The Wings have cap space, and especially with a new arena in the works, they still have a lot to offer. "You kind of hear the luster's worn off," Holland said. "I don't think the luster has worn off the Detroit Red Wings." The Wings have assets. They signed Damien Brunner, who put up big numbers with Zetterberg in Switzerland during the lockout. They promoted defenseman Brendan Smith, who has been over-ripening in the minors. They think Gustav Nyquist and Tomas Tatar can play in the NHL but will keep holding them back, anyway. They have high hopes for prospects like Calle Jarnkrok and Mattias Backman. Not all will pan out, but if some do – and if one or two pull a Datsyuk or Zetterberg – the Wings will keep being the Wings. "It's a culture," Holland said. "If we're going to continue to compete with teams that have had high picks, we have to have a culture. We have to believe in the culture. We have to stick to the culture, the philosophy, and if we veer off the philosophy, the culture, I think then that you're probably looking at going in a different direction." In other words, as long as Holland is the Wings GM, this is the way it will be. "We're going to stick to the program. We're drafting. We're developing," Holland said. "The program is patience. The program is to have a plan. The program is to slowly turn the wheel. And the program is, when you get up to Detroit, that we've got real good leaders that teach you how to play the style of play that we think you need to play to compete with teams that have superstars." "We all lead this team by doing the right things every day on and off the ice," Zetterberg said, "and together we will carry on the great tradition we have in this fine organization." It was meant to be a ‘C’ change, not a sea change.